Sammo Hung’s heartfelt homage to Bruce Lee is a scatterbrained triumph – as equally absurd as it is endearing and packed with some great fight sequences. Sammo (who worked with Bruce Lee on Enter the Dragon) was more qualified than most to carry on the mantle of the fallen star, rather than the majority of imitators that actually followed – even if Sammo’s burly frame and slapstick persona betrayed an extreme athleticism and skill for Lee-like mimicry. In his second feature as director, Sammo channels his passion for his idol through the humble, childlike and (seemingly) autobiographical character of a naïve country pig farmer who travels to Hong Kong to help work in his cousin’s restaurant. In a set up more flimsy than even a Bruce Lee film, Sammo is embroiled in a bizarre battle between a group of antique forgers and their run-around street thugs. They hire three international fighters (a la The Way of the Dragon) to give Sammo a trio of punching bags for the final reel, one of which is Lee Hoi-san doing a particularly revolting Jim Kelly impression with an afro wig, loud flares and (oh dear) black make up. The majority of the choreography is lifted directly from Lee’s films, tellingly juxtaposed with Hung’s supreme skill in traditional Chinese kung fu techniques, which is particularly evident during his final weapons duel with Leung Kar-yan. 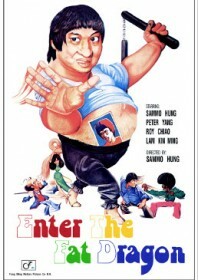 But the best sequence comes halfway through the film when Sammo is hired to play an extra in a Bruceploitation film, culminating in the Fat Dragon pounding the life out of a Bruce Lee imitator. “Try harder if you want to imitate him!” Sammo yells whilst demonstrating quite accurately how to do it properly. Studio: H.K. Fong Ming Motion Picture Co.